We match engineers to the jobs they’ll love. If you have the right Fit Score™ for a job opening, you'll have the option of sharing your contact info with the interested employer. Otherwise, your information will always stay private. 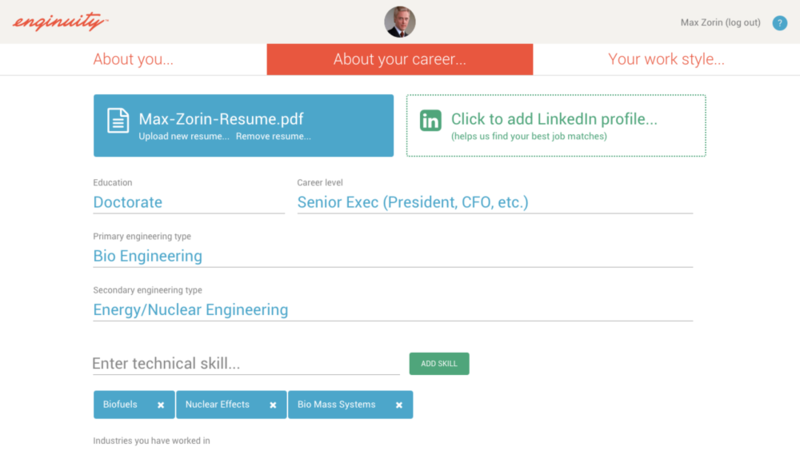 Tell us about your education, skills, certifications, and upload your resume and LinkedIn profile. It's easy, fun, and only takes a few minutes. Let us know how you like to work and the kind of people you like to work with. We ask all the right questions about your work preferences and the kind of culture that you feel comfortable in. If you have the right Fit Score™ and you release your contact info, the company with the job opening will see how you stack up against the other matches. All your personal information will be shared along with how well you are matched with the job preferences and the company culture. After you've approved to release your personal contact information, Enginuity gives the company all the tools it needs to take the next step in their hiring process. So get ready, the next call may be for you!